Shomrei Torah's KADIMA chapter is open to 5th – 7th graders. Once a month on Saturday nights, Tuesdays after religious school or Sunday afternoons, our group meets in the synagogue building or elsewhere. Our activities include all kinds of engaging, fun activities with a dollop of Judaism and Zionism. From overnight's in the synagogue, baking cookies for the American Red Cross blood drive and the local police department, photo scavenger hunts and chocolate seders, KADIMA is fun and educational. KADIMA is the international youth organization for Jewish pre-teens. 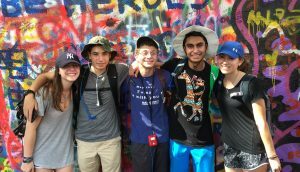 Sponsored by the United Synagogue of Conservative Judaism, KADIMA offers programs locally and regionally.